Las Vegas is now only months away from officially becoming a major professional sports city. We have rapidly moved from famine to relative feast — last year landing an expansion National Hockey League franchise and last month learning the city will be the new home of one of the National Football League’s most storied teams. 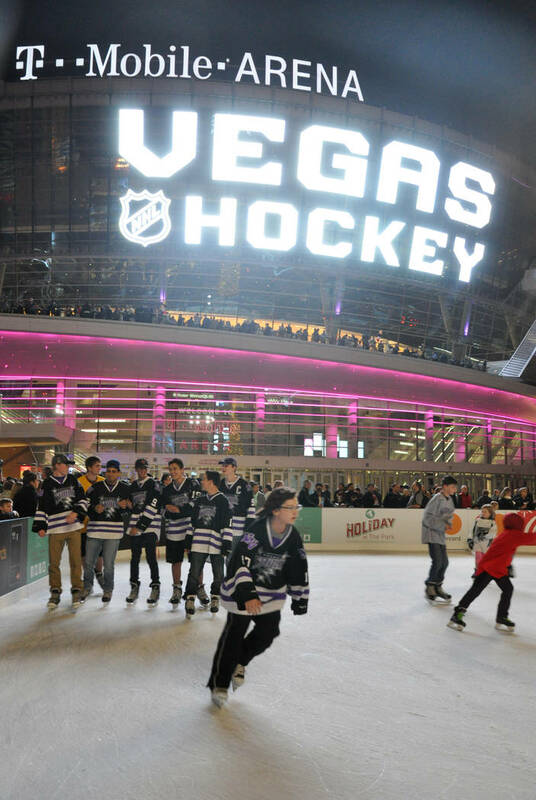 Buford Davis/Las Vegas Business Press A temporary ice rink was created for guests waiting the announcement of the Las Vegas National Hockey League franchise name during a Nov. 22 ceremony outside T-Mobile Arena. 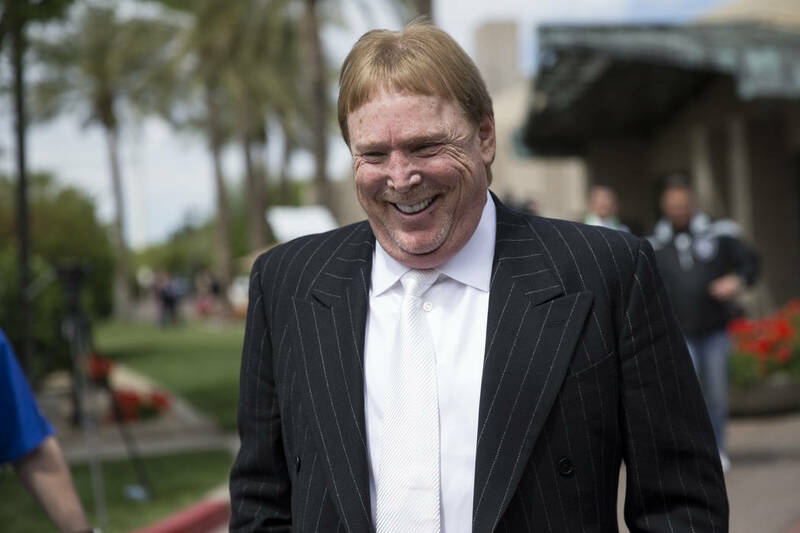 Erik Verduzco/Las Vegas Business Press Oakland Raiders owner Mark Davis after the NFL approved the Raiders move to Las Vegas with a 31-1 vote during Day Two of the NFL Annual Meeting on March 27 in Phoenix, Arizona. A flurry of activity is underway from a range of entities — both government and private — to grow the sports snowball that could potentially include soccer, basketball and baseball as well as boutique events, including NASCAR and rodeo. 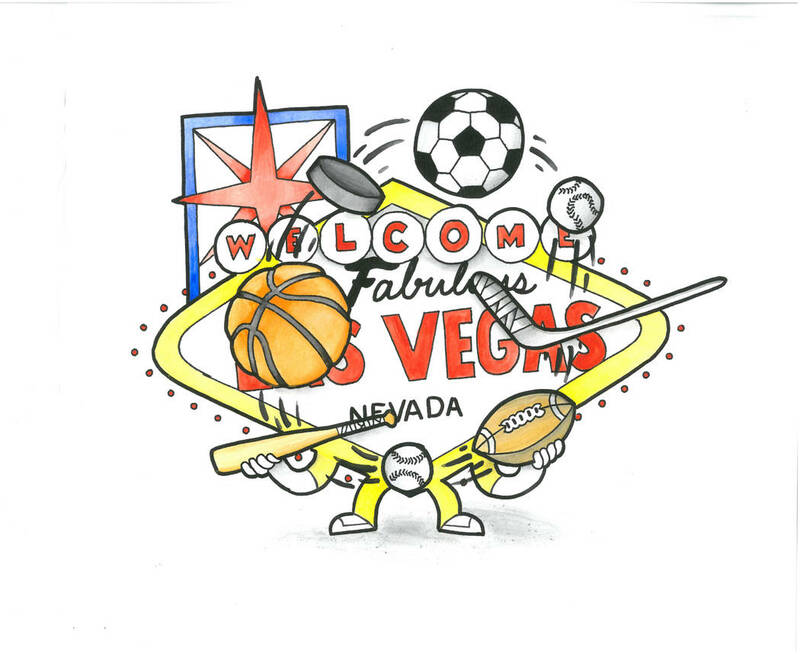 So it is an exciting time to be a sports enthusiast in Southern Nevada or a business that services them? But are pro sports really the economic boon to a community they are often touted to be? And how much is too much for a city that, despite rapid and continuing growth — still ranks as only the 28th largest municipality in the United States, according to U.S. Census Bureau estimates? The identity of the city’s first pro sports franchise — the NHL’s Vegas Golden Knights — was revealed along with the team logo, a Hellenic-style helmet with a ‘V’ emerging from the negative space on Nov. 22 at T-Mobile Arena. The team hired former Florida Panthers head coach Gerard Gallant earlier this week to lead behind the bench, and the June 20 expansion draft will deliver a roster composed of one seasoned player plucked from each of the other 30 teams. When the puck drops in October to launch the Golden Knights’ 2017-2018 season, it will mark the beginning of the city’s pro sports era, the financial and social results of which are difficult to predict. The initiative began in late 2014 when Bill Foley, chairman of Fidelity National Financial, was given the green light by NHL Commissioner Gary Bettman to begin a season-ticket drive for a hypothetical Las Vegas team. The exercise was a way of gauging public enthusiasm for the sport, and within six months 13,000 season ticket deposits had been secured. Las Vegas competed with Quebec City for the lone 2017 expansion franchise. The Canadian bid was an attempt to revive the Quebec Nordiques, an NHL team for 16 seasons before departing for Denver in 1996, but the league announced in June that it had selected Las Vegas. George McPhee, who spent five years as Washington Capitals general manager, was hired as the Golden Knights’ GM. Las Vegas will play in the Western Conference’s eight-team Pacific Division along with the Anaheim Ducks, Arizona Coyotes, Calgary Flames, Edmonton Oilers, Los Angeles Kings, San Jose Sharks and Vancouver Canucks. 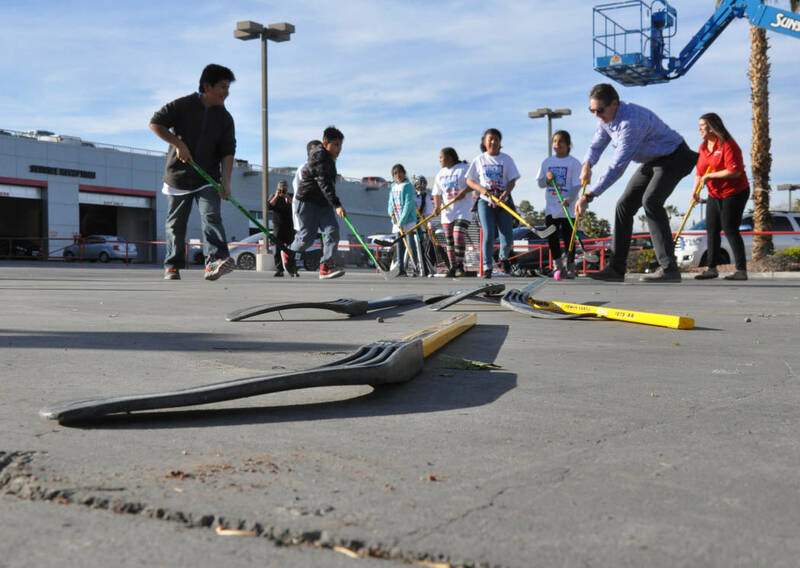 Golden Knights President Kerry Bubolz said he believes community outreach initiatives — especially those focusing on children — are important to building a foundation of support and enthusiasm to expand the sport locally. And nurturing fans in a city that has a very limited history of hockey (the minor league Las Vegas Wranglers had varying levels of support for 11 seasons in the East Coast Hockey League) will be a key factor in long-term success strategies for the franchise. More than 80 percent of total NHL team revenue comes from local sources, according to a 2015 Forbes study, principally ticket and luxury box seat sales, advertising and local TV contracts. The league’s most lucrative team is the New York Rangers, according to Forbes, with a value of $1.25 billion and $229 million in revenue from the 2015-2016 season. The Montréal Canadiens, Toronto Maple Leafs, Chicago Black Hawks and Boston Bruins round out the top five. It is worth noting that all of these teams have deep cultural roots in their communities as members of “the original six” — along with the Detroit Red Wings, ranking eighth — who were the sole NHL franchises between 1942 and the 1967 expansion. These six clubs have collectively amassed more than five centuries of seasons and 64 Stanley Cups. On the other side of the money table are the Carolina Hurricanes, with a franchise value of $230 million in 2015-2016. Just ahead of the Hurricanes, in ascending order, are the Florida Panthers, Arizona Coyotes, Columbus Blue Jackets and Nashville Predators. None of these teams existed in their respective cities before 1993, and only the Hurricanes have a Stanley Cup title. They are also cities without a long tradition of support for the sport at all levels. But Bubolz believes this sort of simplification is deceiving, pointing to Tampa Bay and Nashville as two Southern organizations who are beginning to thrive. The NHL has once before included a “Golden” franchise – the California Golden Seals, who came into the league in 1967 as the Oakland Seals and altered their name in 1970. The Golden Seals struggled on the ice and at the box office, departing the city in 1976 to become the Cleveland Barons. The Barons were no more fortunate than the Golden Seals and were forced to merge with the Minnesota North Stars – now the Dallas Stars – at the end of the 1977-78 season. Las Vegas hockey fans hope the fate of the Knights is significantly more golden. It looks something like an alien invasion film, the architectural rendering of the futuristic sports stadium that will be the new home of the Las Vegas Raiders in 2020. The $1.9 million, 65,000-seat facility was approved by a special session of the Legislature in October and will be funded by a $750 million county bond — to be repaid through a hotel tax implemented in January, plus $500 million from the Raiders and $650 million from Bank of America. The deal was placed in jeopardy in late January when Sheldon Adelson, CEO of Las Vegas Sands Corp., withdrew his intended commitment to contribute $650 million due to a disagreement with the Raiders over lease terms. The absence of Adelson’s participation threatened to sink the deal, which was revived by the funding agreement with Bank of America, finalized in March. The stadium is expected to be the most expensive sports venue built to date, eclipsing New Jersey’s Met Life Stadium — the current priciest facility — by $300 million. But if the trend holds, the Las Vegas stadium could soon seem modest. The proposed Tokyo Olympic Stadium is estimated to cost 252 million yen, or $2.31 billion at the current exchange rate. The NFL has historically been apprehensive about Las Vegas due to the pervasive gaming culture and, maybe more significantly, its size. The city will be the fifth-smallest NFL market, just ahead of Jacksonville, Florida; New Orleans; and Buffalo, New York. Being a small football market has obvious challenges. Buffalo and Jacksonville have both been the subject of periodic relocation speculation in recent years, and the New Orleans Saints were eyeing San Antonio as a new home around the time of Hurricane Katrina in August 2005. Despite the extensive damage the storm inflicted on the aging and outdated Superdome (constructed in 1975, during the era of bowl-style stadiums that have since largely been demolished), the swell of civic pride and international goodwill directed at the city were significant factors in successfully crafting an agreement that keeps the team in the Big Easy through 2025. The smallest NFL market is Green Bay, Wisconsin, with a population of only 105,000. The team now has a deep and loyal fan base that pulls from the larger city of Milwaukee, just two hours to the south. But for decades Green Bay’s support at Lambeau Field was so tepid that two to four home games were played annually at various Milwaukee venues between 1934 and 1994. But even though the Raiders are heading to a small city, they are leaving an even smaller one. Oakland is the 45th largest U.S. city, with a population of 419,000, and although it is part of a much larger metropolitan area of 7.1 million, the team is sharing territory with five other major sports franchises, including the NFL’s San Francisco 49ers. Despite the on-field success that included a playoff appearance for the first time in 14 seasons, the Raiders had the lowest average game attendance in the league in 2016 at 54,584, according to ESPN, in a stadium that seats only 56,057 for football. The team plans to spend at least two more seasons at Oakland-Alameda County Coliseum before packing for Vegas. It might not be pretty in the Black Hole. The NFL tipped its cards on the Raiders relocation question — no doubt strategically — when Commissioner Roger Goodell gave an indication that the league’s long-held negative position on the Las Vegas market was changing during a Dec. 14 press conference. In the end, league owners overwhelming approval of the Raiders’ move. The vote was 31-1, the only dissenter being Miami Dolphins owner Stephen Ross. Sibling rivalry or brothers in arms? Will a new pro hockey and football team prosper together in a small market, or will competition between franchises for attention, loyalty and dollars make it more difficult for both the Golden Knights and Raiders to become established in the city? Foley struck a positive tone in a statement published on NHL.com when the Raiders move was made official. He said only select cities have both an NHL and NFL team, and it should be a source of pride for Las Vegans to be among them (it’s more the rule than the exception — 19 U.S. cities have franchises from both leagues, and all six Canadian NHL cities also have Canadian Football League franchises). But Foley has made subsequent public comments questioning the large public funding element of the Raiders’ stadium deal and said he would have preferred not to have to share the city with another pro franchise as quickly as will now happen. “When I think about the NFL coming, it is a huge brand with national exposure,” Bubolz said. “They are going to bring a lot of eyeballs and bring attention from a lot of national companies that otherwise might not look at the 40th-largest television market in the country and invest their dollars there. That brings opportunities for us. I think it is important to work together, not only with the Raiders but with other organizations growing sports in this market. There is no strong consensus among economists about the direct economic impact communities receive from pro franchises and the state-of-the-art venues that feature them. But the more significant value might be something more intangible, defying monetary summation. Las Vegas was once considered by Major League Baseball as a new home for the Montréal Expos after the league purchased the club in 2002. But the league opted to relocate the franchise in Washington, D.C., where it became the Nationals. MLB commissioner Rob Manfred has said the league could consider the city for future expansion. Manfred has offered a list of places that MLB might consider placing expansion franchises, including Charlotte, North Carolina; Oklahoma City; San Antonio; Portland, Oregon; Northern New Jersey; and Las Vegas. MLB has 30 teams split evenly into the American and National leagues. It has not expanded since 1998. Manfred has not indicated when the league plans to expand but said he would like to see at least one of the two new teams placed in a city outside the United States. Monterrey, Mexico, also made the commissioner’s list, as did Montréal. The Canadian city has been aggressively advocating for the return of a team and might be considered a prime choice if a new ballpark is guaranteed to replace the infrequently used Big O – the 1976 Olympic Stadium that housed the Expos for 27 years. Another question is the long-term future of the Tampa Bay Rays and Oakland A’s, which have unresolved stadium issues. Efforts to bring a pro basketball franchise to Las Vegas have been spearheaded by local leadership from the gaming industry and industry talent, though nothing concrete has materialized. One move was made by businessman Jackie Robinson, who played basketball at the University of Nevada, Las Vegas in the 1970s before turning pro in 1978 with the Seattle Supersonics. The California native’s seven-year pro career included stints with three NBA teams plus clubs in Europe and Israel. Near the end of 2014, Robinson broke ground on a planned $1.4 billion, 22,000-seat, retractable-roof arena and hotel on the former Wet ‘n’ Wild water park site, just south of the SLS Las Vegas. Around that time, he told the Las Vegas Review-Journal he was seeking a new NBA team for Las Vegas. Little had been done to move the project forward in subsequent years, but construction crews began grading the property in the spring with plans to begin work on an underground parking facility and utility installation, Robinson told the newspaper. He has reported that he expects the project to be finished by December 2019. On the south end of the Strip, another well-known figure — MGM Resorts International Chairman and CEO Jim Murren — is also brewing a plan to bring the NBA to Las Vegas. Murren told Nevada Public Radio in an interview in October that he is actively pursuing an NBA team for Southern Nevada, which would likely be an existing franchise, not an expansion team. 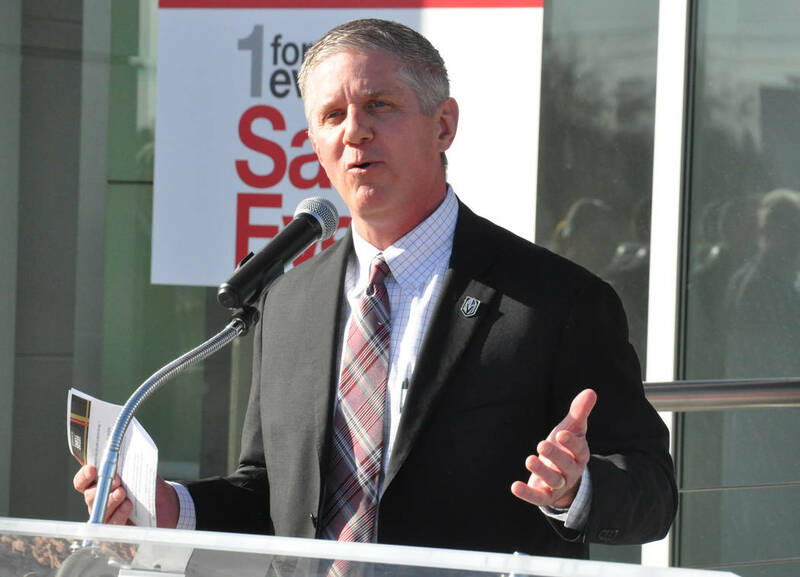 “Imagine the thought of having a professional hockey team, a professional football team, a professional soccer team, probably a professional basketball team — I’m working on that,” Murren said on KNPR’s State of Nevada program. League officials want to return a team to Seattle, if possible (the Supersonics moved to Oklahoma City after the 2008-9 season), and expansion seems the likely means, as no NBA team appears especially vulnerable to relocation efforts at the moment. Although these things have a way of changing. No expansion plans have been released by the league, but when it does occur, two teams are expected to be added. Possible competitors with Seattle and Las Vegas include Louisville, Kentucky; Pittsburgh; Mexico City; and Vancouver, British Columbia. Major League Soccer added two expansion clubs in 2017 — Atlanta United and Minnesota United — and officials announced last year that they soon plan to further expand by four clubs – to a total of 28. But is Las Vegas even in consideration to be among them? The city has flirted with Major League Soccer before, in the form of a proposed $200 million stadium in Symphony Park that failed to gain approval in 2015 and a plan to renovate Cashman Field as a soccer-only facility. The deal would be contingent on — among other things — a new home for the minor-league baseball team, the Las Vegas 51s. Miami FC and a second Los Angeles club (the L.A. Galaxy are founding members) will make up half the expansion. MLS Commissioner Don Garber has named Sacramento, California; St. Louis; Austin, Texas; San Antonio; Cincinnati; Detroit; and San Diego as official candidates for the remaining two teams. 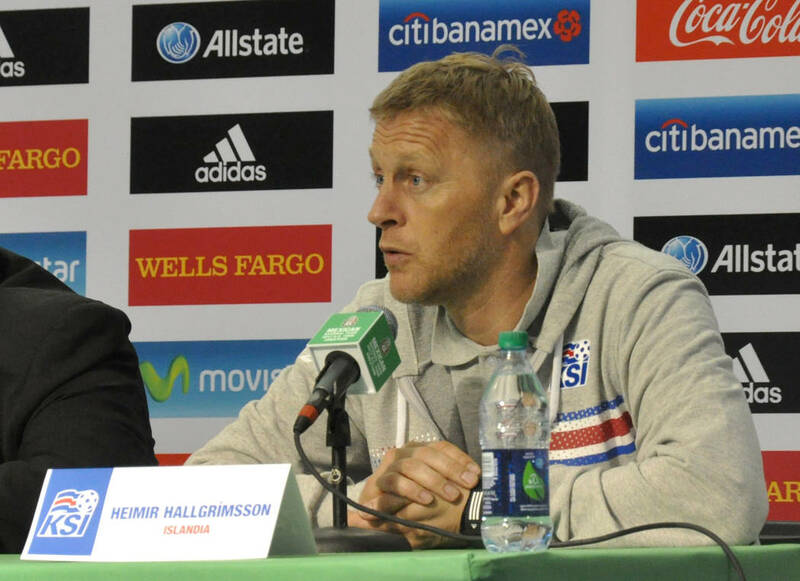 Indications are that Las Vegas will have to wait for professional soccer, but there are signs that the city would be a strong home for the sport. 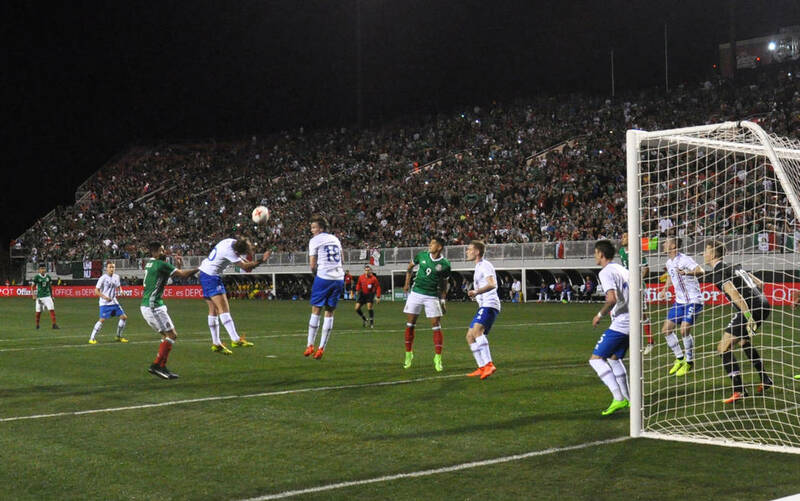 The Mexican National team made their first appearance in the city in February, a sold-out friendly against European giant-killers Iceland at Sam Boyd Stadium. 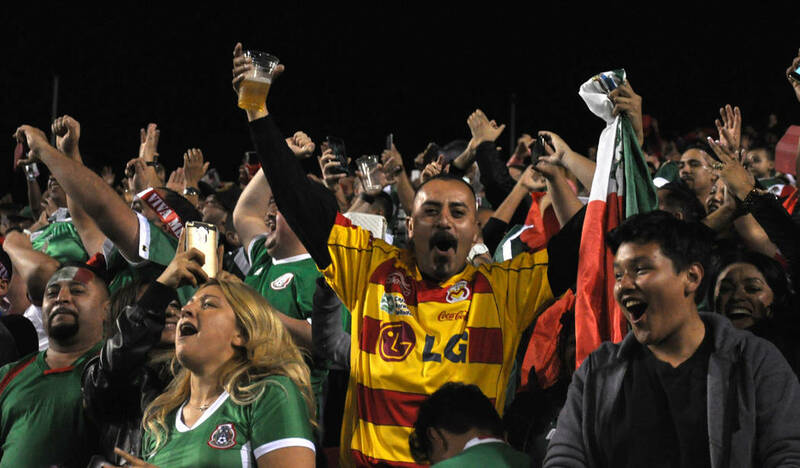 Much of the talk among government officials in support of Las Vegas soccer focuses on the city’s immigrant and domestic Latino population, which accounts for 33 percent of its residents. But this ignores the deep-rooted enthusiasm for the sport that is not bounded by demographics. If the city’s momentum in attracting pro sports holds, it is a record that might not last for long. The Las Vegas Review-Journal and the Las Vegas Business Press are owned by the family of Sheldon Adelson, chairman and CEO of Las Vegas Sands Corp.